This post was written by Liz Fox, a UCL ESRC-funded anthropology PhD candidate affiliated to the Emerging Subjects project. “Come quick! They’re giving money after all!” Baatar rushed into the ger where his relatives were sitting, discussing the Mongolian parliamentary election that was taking place that day. The road to the election had been both long and disappointing and all present were in agreement that it had been the “dirtiest” election the country had seen in its 26 years of democracy. From the start there was mudslinging, or as it is known in Mongolian, “black PR” (har pr). Each of the three presidential candidates had been accused of one scandal or another, whether it was Ganbaatar’s (of the MAHN, or Mongolian People’s Revolutionary Party) 50,000 KRW bribe from the Moon religious group, Battulga’s (of the AN, or Democratic Party) 44 companies and messy family life, including a Russian wife and a son connected to drugs, or Enkhbold’s (of the MAN, or Mongolian People’s Party) selling of land when he was UB mayor, his feature in two secretly-filmed viral videos that tie him to bribery and the selling of government positions, and the accusations that he is actually Chinese. Indeed, when the candidates were announced, many Mongolians said there was no one to choose from, they are all as bad as each other and that it was an “unelectable election” (songuuldgui songuul). I arrived in an Eastern ger district of Ulaanbaatar mere days before the first round election and learned that there had been an upswing in support for Ganbaatar, the Revolutionary Party’s Candidate. For an area that had preferred the MAN over the AN in the previous year’s parliamentary election, the outright rejection of the ruling party’s presidential candidate seemed surprising; and yet, Enkhbold was said to be the worst of the worst. Ganbaatar, the outsider candidate, had managed to differentiate himself in the eyes of ger district voters from the two big party candidates as being an honest and upstanding man. Similar to the popular support that Jawkhlan the singer had galvanised in the parliamentary election a year before, this year Ganbaatar was felt to have a “heart” for the people of Mongolia. Like Jawkhlan, Ganbaatar’s lack of high level education was even seen as a bonus: “What university did Chinggis Khaan graduate from, huh?” a middle-aged supporter asked. Two nights before the election, a ger district-dwelling family and I sat in front of the TV in a small brick home, watching the final debate. The family were open with their criticisms, tutting and shaking their heads at almost everything Enkhbold and Battulga said. They spoke back to the figures on the television regularly with a “Shaaal hudlaa!” (What a liar!) or a sarcastic “Oo saihan yarij bn” (How nicely he speaks). In contrast, Ganbaatar’s earnest propositions were followed with resounding expressions of approval, “Yag zuw!”, “Unen shvv” or “Tiishdee”. It was clear that this election had become largely driven by emotion. For those on the margins who have seen 26 year of democracy lead only to increasing inequality and economic turmoil, the fat cats at the top eating the country’s natural bounty, sweet words and promises from wealthy politicians mean little. “They’re all the same,” people repeated, “they’ll say anything and then, when they’re elected, they’ll do nothing but eat”. While there were rumours of cash hand outs in the run-up to the parliamentary election last year, politicians also used fairly “clean” techniques in their attempts to attract votes, such as building a new road or the distribution of the Tavan Tolgoi shares. This year, however, cash was flowing everywhere. Phone calls were made back and forth and what felt like hundreds of cars descended on the neighbourhood. Suddenly the call would go around, “the car is here!” there would be a rush to check for one’s ID card and four or five people at a time would leave the ger to meet the car. After the doors closed, each person would be handed a 20,000MNT note and told, “Vote for Enkhbold! After you’ve voted, bring your little white paper receipt back to us”. The passengers would then be dropped off a little distance from the local school that served as a polling station to avoid police detection. The party workers, temporary employees who stood to gain a 300,000 MNT salary for 20 days of work, would also receive payment according to the number of ‘white papers’ they collected from voters. In some areas, parties were offering 100,000MNT for 30 papers, in other areas it was 100,000 for 5. An instant economy of white papers then sprung up: people bartered over them, sold them to one another and told each other to deliver them to so-and-so. As matters unfolded on the ground, people were also glued to Facebook checking for news. A Democratic Party car carrying 120 million MNT to be distributed to voters in Western Mongolian provinces caused a stir. It was clear that both parties would do whatever it took to win. Ger district families were quick to take advantage of the parties’ activities. Some relatives who live in the countryside but were visiting the city had wrongly heard that they could vote anywhere. Believing they could vote in Ulaanbaatar, they didn’t return to the countryside in time for the election. That, however, did not stop them from getting in the car and pledging to vote for Enkhbold in exchange for an easy 20,000MNT. A couple residents under the voting age of 18 were able to collect the money. Every person I know who took the MAN party’s money and voted, voted for Ganbaatar. Indeed, people took great satisfaction in having out-hustled the “hustlers” (luiwerchin) who had tried to buy their votes. Although the money was a bonus and everyone chased it, there remained some ambivalence and debate over whether it was truly clean. “They’ll say they bought us poor people’s votes cheaply,” one woman exclaimed passionately, the 20,000MNT note hidden in her clenched fist, “but they’re wrong! They didn’t buy anything. We didn’t even vote for their candidate. And anyway, why shouldn’t we take the money? They sit up there eating everything without a care for us out here. There’s nothing wrong with taking a little back from what’s been stolen from us!” While there was disappointment with the electoral proceedings, no one seemed completely cynical about the election itself. People voted for Ganbaatar with their hearts and truly hoped he would win, even as they worried that with the amount of money being splashed around by the big parties, their outsider candidate would have no chance. Polls closed at 10pm and the election circus around the bus stop began to clear. People returned home to hear the 10 o’clock announcement of the early results. There was great shock and happiness when it became clear that Enkhbold had done poorly. The local area had indeed elected Ganbaatar, despite the payments, and the countryside relatives were relieved to see that their homeland had also supported Ganbaatar, without their votes. While the AN candidate Battulga lead the race, Ganbaatar’s strong showing looked like it would force a run-off election as no candidate would reach the minimum 50% of the vote. That prospect was incredibly exciting as people felt sure in a two-horse, second-round race Ganbaatar would win. The results continued to come it as the night progressed, the family remained glued to the television until around 2am. By that point, the picture seemed clear and the large extended family one by one fell asleep in their little brick home. The shock upon awakening to hear that in the night Enkhbold had somehow overtaken Ganbaatar cannot be overstated. Apparently, one province’s election centre had lost power during the count and when the power was reconnected, the numbers favoured Enkhbold enough to push him ahead of Ganbaatar. In the ger district, it was universally considered a fraud and a lie. People felt for Ganbaatar, they argued he had run a clean race – unable to raise the funds to distribute the kinds of cash that the other two candidates threw around – and yet, or perhaps therefore, he had lost. Some days of confusion and dismay followed. There was debate over how exactly the second round would be organised, but eventually it became clear Ganbaatar had been cut from the race: the second round would have no clean candidate. In the days between the first and second round elections, the only positive people could find in the situation was the possibility that the second round election might encourage even bigger cash hand-outs. Ger district residents had heard from countryside relatives that up to 50,000MNT per vote had been being distributed and were excited at the prospect another cash bonus. This hope, however, was only half the story. Politically-speaking, people remained committed to Ganbaatar, or at the very least committed against the two remaining candidates. A plan began to form to submit black ballots at the very least as a protest against Ganbaatar’s stolen election and perhaps even to force a third election with three new candidates. Rumours continued to swirl about the dark methods by which Enkhbold would assure his own victory: apparently, his party workers would collect people’s registration numbers and then ‘hack’ the electronic voting machines to ensure that those votes would go to him. Indeed, two days before the election a relative arrived at the home asking the family to write down their registration numbers and promising to give them 20,000. As it happened only two siblings were home at the time, one 19, the other 23. What followed was a tense but jovial negotiation. Their uncle tried to use his relative authority to ‘encourage’ them to write down all the eligible family members’ ID numbers, while the other two slid between positions, sometimes deferring to their absent mother’s authority (their mother being the uncle’s elder sister) telling him to ask her, and other times insisting that they be given the money up front or that they would only sell for a higher price. Eventually the uncle left to try to collect the neighbours’ ID numbers, telling the two he would be back in the evening. The morning of the election came and went without event. The previous day the ruling party had released a sudden notice that the ‘children’s money’ (20,000MNT/month per child) that had been stopped for all but the poorest families since February would suddenly be restored: the full amount being automatically deposited into people’s accounts. Queues at the bank reached into the hundreds. For the ger district family, this development was a disappointment. As a poor family they had been collecting the children’s money every month as a vital part of their monthly income. As such, the windfall that came to richer families did not come to them at all: further proof in fact that the ruling party didn’t care about the poorest citizens. It wasn’t until the evening until Baatar burst into the ger announcing that there would be pay-outs after all. This time no car came and the eligible voters walked to the polling station. A phone call told them to wait behind a small shop that sells second-hand clothes. Then a further call told them to go behind the school. A third call then told them to vote first and collect the money afterwards. The family duly deposited their blank ballots and then began to congregate with neighbours and relatives outside the polling station. Rumours spread this way and that, and yet no money appeared. A middle-aged man told me, “It’s sad isn’t it to see how we Mongolians will run after only 20,000MNT. But what can we do? We need the money and if they’re going to give it out why shouldn’t we have some?” Tired of waiting at the bus stop, people headed home. Eventually that night the money came: another 20,000MNT each. Despite his efforts, both black and white, Enkhbold did not win the election. Battulga defeated him and will be inaugurated today (the 10th). Ger district residents seemed to have lost interest in politics the day after the election. Some people even said, “Maybe it would have been better if Enkhbold had won: what can a AN president do in the face of a majority MAN parliament?” People were proud of their blank ballots: around 100,000 were cast across the country, but not enough to force another election. For the most part, however, things returned to normal: politicians don’t care about the ger district and their chronic absence speaks louder than the occasional sweet words ger district resident’s hear around elections. Ger district residents resumed their lives, briefly 40,000MNT richer but without any hope that positive change would be on the horizon. This blog was co-authored by Bumochir Dulam and Rebecca Empson. As Mongolians are getting closer to vote for their new President, campaigning among the three candidates, M. Enkhbold from the Peoples Party, Kh. Battulga from the Democratic Party, and S. Ganbaatar from the Revolutionary Party, is in full swing. Like last year’s parliamentary elections, rumours circulate as to the motivations, characters, and aims of the three candidates, and speculations abound about whom is ‘behind’ (or supporting) whom (see our blog post). ‘People [are] constantly searching for meaning – connections and explanations – in actions they [find] difficult to read and understand. In fact this searching for meaning and speculation is [very much] what politics is in Mongolia. It is the speculation of connections and motivations beyond the visible and tangible. To understand politics – or to think politics – is to understand the underside of things, beyond the way things appear to the ordinary eye, to uncover the workings of a kind of magic or religion.’ (Rebecca Empson, 2016). In this post we discuss rumours circulating around the use of Electronic Voting Machines (Mng. Songuuliin Khar Mashin, coll. Khar Khairtsag, ‘Black Box’) in Mongolian elections, and the President’s involvement in securing his successor. In doing so we extend the use of the phrase ‘Black Box’ to explore aspects of Mongolian politics that are unclear or opaque to the general public. Against the background of the 2008 July riots, which were sparked by allegations of fraud surrounding the legislative election and which lead to a state of emergency which lasted for four days and included five civilian deaths (cf. Kaplonski, Delaplace, and Sneath 2008), and in order to go some way in countering speculations of tampering with votes, in June 2012 Electronic Voting Machines were introduced to count votes in the parliamentary elections. The infamous ‘black boxes’ (Mng. Khar Khairtsag) (called ‘New Image Cast’) were brought from America, from a company called ‘Dominion Voting’, by a Mongolian company called Interactive. While some doubted their impartiality, many were impressed and relieved at their implementation, believing that the black boxes were secure and would eliminate human error and bias in counting votes. Results, it was reported, would be sent immediately to the General Election Committee, avoiding manual tabulation by local election officials. 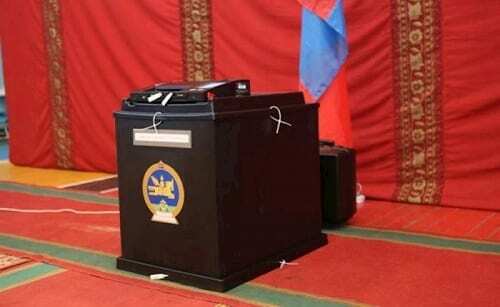 However, on June 30th, 2012, the Mongolian People’s Party and 8 smaller parties questioned the use of the machines and called for a recount of the votes by hand. In contrast, the Democratic Party, headed by Ts. 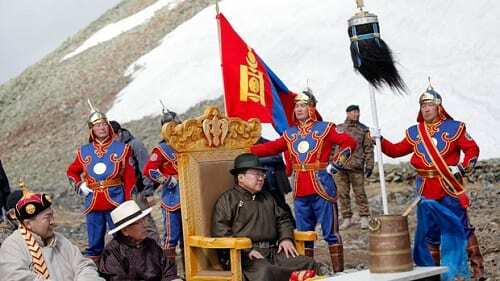 Elbegdorj, backed the automated system and became the majority in the new coalition government. Despite their alleged ‘impartiality’, speculation has continued to circulate about the possibility that the khar mashin’s are rigged or can be ‘hacked’ (songoliin haker) (cf. Oldoh 2017). The General Election Committee (Songuuliin yeronhii horoo) maintains and runs the black boxes and its IT officers are in charge of installing and updating programs on the machines (Bat-Ireedui 2015). According to some, this means that powerful politicians could very well influence and manipulate the General Election Committee, making sure the machines were used for their own means. On the 10th December 2015 a protest was arranged in Mongolia against the use of electronic voting machines in elections. On the same day, Delkhiin Mongolchuud Radio posted a Mongolian dubbed version of the American film ‘Hacking Democracy’, directed by Simon Ardzzone. This film showed how elections could be tampered with using various kinds of technology, including the Electronic Voting Machines, and emphasised how they could ‘steal’ (luivar) votes. On the same day as the film circulated a protest was arranged ‘for a fair election without the use of the corrupt black machine’ and an effigy of the ‘khar mashin’ was burnt in Ulaanbaatar. In 2017, further protests were arranged by the ‘Free Association of Elders’ (Ahmadyn choloot holboo) (Olziibayar 2017), ‘United Association of non-party citizens’ (Nam bus irgediin negdsen holboo) (Urantsetseg 2017), and the ‘Fair centre’ for the protection of victims’ rights and interests (Hohirogchidyn erh ashgiig hamgaalah ‘shudraga tov’) (Uchral 2017) calling for an end of the use of Electronic Voting Machines to count election votes. Regardless of such protests, the electronic voting boxes will be used in 50 % of votes in the up-coming presidential election, despite rumours circulating that Ts. Elbegdorj controls the very black boxes that he used to bring himself and his own party into power. Indeed, people speculate that he can determine their outcome. This idea is so prevalent that Kh. Battulga, the candidate of the Democratic Party, is now suspected to be involved in an attempt to buy the very same machines from America for use in the up-coming elections to count his own votes. M. Udaanjargal, his Political Advisor (zovloh), is now under police investigation for attempting to purchase the boxes from the American company ‘Dominion Voting Systems’ (Od 2017). If this rumour is correct, then it is held by many to confirm speculation that the electronic voting boxes can be used to hack votes. Rumours over Elbegdorj’s ‘ownership’ and control over the black boxes extend to speculation about his control over the whole elections. The black boxes and uncertainty over the ‘true’ power behind them becomes a metaphor for the different candidates and questions over who actually ‘controls’ them. In this murky world of political wrangling people speculate that Elbegdorj is in fact behind the appointment of all three candidates, having deliberately supported them at various times, and put them in place to rig the election in order to determine his own succession. A major reason for this, it is speculated, is to secure himself against future corruption charges (particularly the Erdenet 49% share, etc) once he has seeded his position. Attempting to align himself with all three candidates, he hopes to avoid any opposition that will come to question his reign as President. Such speculation circulates along the following lines: once a major donor and founding supporter of HUN Nam (Hodolmoriin Undesnii Nam – the National Labour Party), he is behind the appointment of the candidate S. Ganbaatar. He is also a supporter Kh. Battulga, who supported Elbegdorj’s presidential campaign eight years ago, and who at this election seems to be garnering the most public support. However, these two might be considered mere puppets for his steadfast support of M. Enkhbold for President, whom many in fact consider to be the only ‘real’ political candidate. Despite his political credentials, many worry that M. Enkhbold’s appointment could provoke riots among the public who largely support Kh. Battulga (as shown by the wide range of people who supported him when his offices were raided last year), and at worst burn down the People’s Party building, as in the 2008 riots. Rumours also circulate that Elbegdorj is protecting himself against future corruption charges by confirming his connections within the MANAN group or faction (frakts). MANAN is a term derived from two acronyms: ‘MAN’, the acronym for the Mongolian People’s Party, Mongol Ardyn Nam, and ‘AN’, the acronym for the Democratic Party, Ardchilsan Nam. Pairing ‘MAN’ with ‘AN’ makes the Mongolian term for ‘fog’ (Manan), hinting at the blurred and opaque character of Mongolian political alliances and factions. It is speculated that the key people heading the MANAN faction is M. Enkhbold, chair of the People’s Party, current speaker and presidential candidate, and Ts. Elbegdorj, the current President of Mongolia. These high-ranking politicians within MANAN are seen as the most powerful politicians in the country, wielding the most power. Elbegdorj’s close association with MANAN, his control over the black boxes, over the supreme court, over the constitution, over the media, and, indeed, over the outcome of the current election leads some to refer to him as the ‘Khaan of Mongolia’. No wonder, then, that the appointment of some candidates over others, and the control of certain voting systems is thought to be highly divisive. Attending to the circulation of such speculation and rumour in this blog piece is not meant to ‘expose’ some sacred truth behind the current ‘fog’ of democracy. Rather it alerts us to the form that politics is currently taking in Mongolia. Through this we see that trying to uncover motivations and speculating about new ones is a major feature of political conversations among the general public. Once this fog has cleared, it is hoped by many that the ‘true’ nature of what politics should be about will be allowed to flourish. Perhaps then the black boxes will come to symbolise something entirely different. 2008 ‘The end of post-socialism? An account of the 1st of July riots in Ulaanbaatar, Mongolia,’ Kaplonski, Chris, Gregory Delaplace and David Sneath; Inner Asia 10(2): 353-365. In English and Mongolian the term ‘black box’ or ‘khar khairtsag’ is a metaphor for a system where you can see what is entering and exiting but you do not know what is going on inside the system. This blog is a hub to exchange ideas and discuss themes, topics, and ongoing research relating to our project. We encourage you to participate by posting comments to the discussion section. Our work, whether individually or collectively, is licensed under a Creative Commons Attribution-NonCommercial 4.0 International License.